The condensate load calculations are based on a surrounding temperature 70 oF and 80% efficient insulation. For temperatures at 0 oF the loads should be added approximately 50%. Engineering ToolBox, (2003). Insulated Steam Pipes - Generated Condensate. 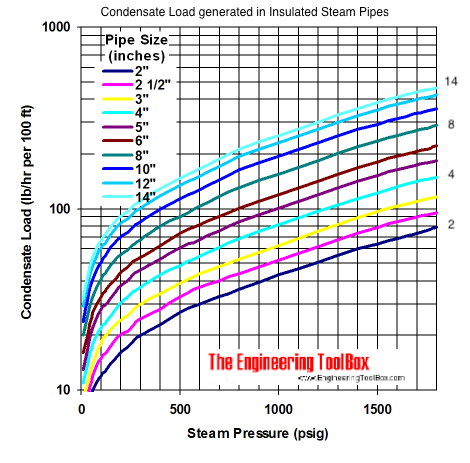 [online] Available at: https://www.engineeringtoolbox.com/condensate-load-insulated-steam-pipes-d_275.html [Accessed Day Mo. Year].